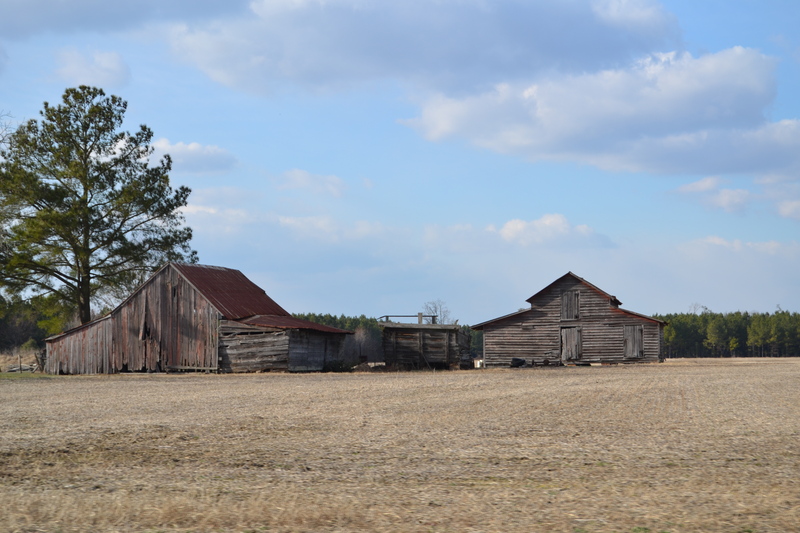 Last week, on my way to have lunch with Donna, I passed by this old farm. Although I don’t travel that road often, I am familiar with this property, so I stopped to take pictures. 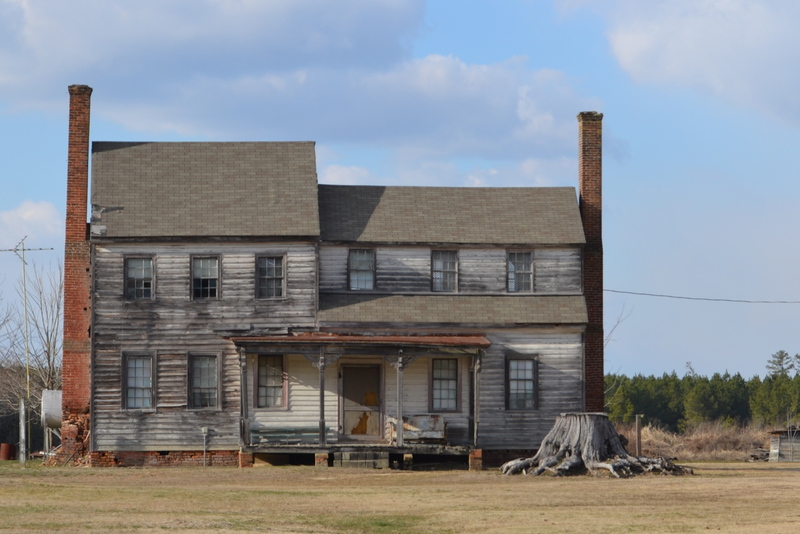 This old house, known as the Charles Chapman house, sits to the left of the barns. Some portions of it are believed to have been built as early as 1836. Believe it or not, a family still lives here. This entry was posted in Traveling Days and tagged 1836 house, barn charm, charles chapman house isle of wight county va, old barns. Bookmark the permalink. Is that a tree stump to the right? What awesome shade it must have given that two story house. And two chimneys suggest offering warmth on both sides of the house. I think the whole farm is charming in a antique kind of way! The screen door cracks me up.. 😀 No pet door needed, in fact the bottom torn out part looks like a kitty or dog sitting sideways! I have to believe it would be a little drafty in there. Very charming Dianna. Despite it being old, it is as neat as a pin. Is that a loveseat on the porch?!! That’s a lot of beautiful barn wood 😉 and the house actually seems to be in great shape for being so old. I wonder, is that the north-side of those structures (barns)? Maybe the windows are on other walls. Just thinking out loud. I love trying to figure out what structures might have been created for originally. at first I thought you meant Charlie Chapman 🙂 Beautiful! I have a photo of this house in my TV room thanks to you. It is one of my favorites. talk about this old house, WoW, what a great spot and i love that you always know a little bit of history about the places you show us!! Oh Dianna, this house and barn are soooo fascinating! I can’t imagine people actually living there. Wonderful photos! That could be a beautiful house. With a little time and effort. A great collection of structures … I can definitely see 1836 here… maybe the right-hand side of the house?? I don’t know that I’ve ever seen these before…. All I can think of is; that’s a big drafty house to heat! I would love to see it restored. Maybe they will! wow! LOVE that old siding AND that huge tree stump next to the house. I’d love to see the inside. It might be a good idea to fix that roof, otherwise it looks pretty solid if worn. Nice photos! Great barns – I like the way the wood is vertical on one and horizontal on another. The house is so cool – hard to believe someone is living there. I’d love to go inside! The stump is awesome! Oh my- so cool! I would love to see the inside of that house- so much history! Movie set. So many possibilities!! 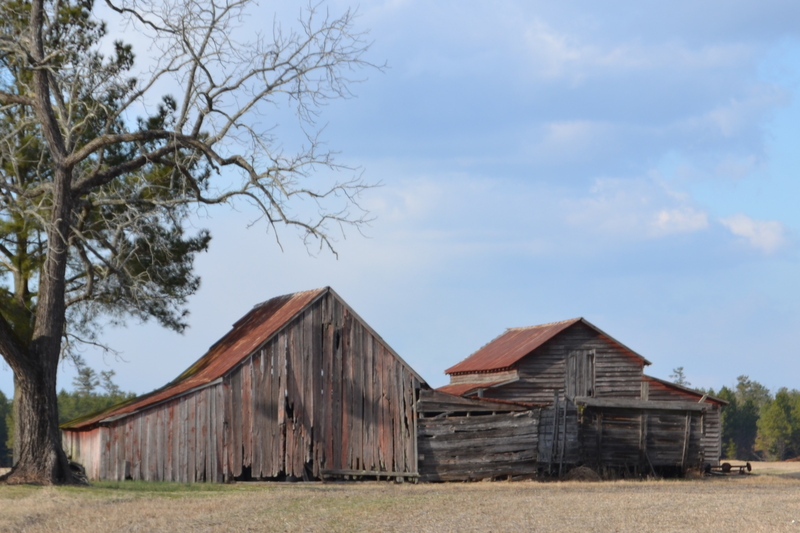 Oh, my, those barns really appeal to me…and how I would love to explore that house. The barns are nice, but I LOVE the old house and glad it’s being used by a family. Looks like it has lots of rooms — would love to see them. Oh wow, I wish they would rescue that old house and make it a Museum. A great find! The house has so much potential–just a little paint, some new shingles. . . .
That tree must have really crowded the house when it matured, the stump looks huge! What a lovely find. Looks like it could be the setting for a movie. I wonder what kind of tree that was. The stump is enormous, so the tree must have been majestic. Too bad it’s gone. Great pictures!